Our last fraction lesson was about creating equivalent fractions. 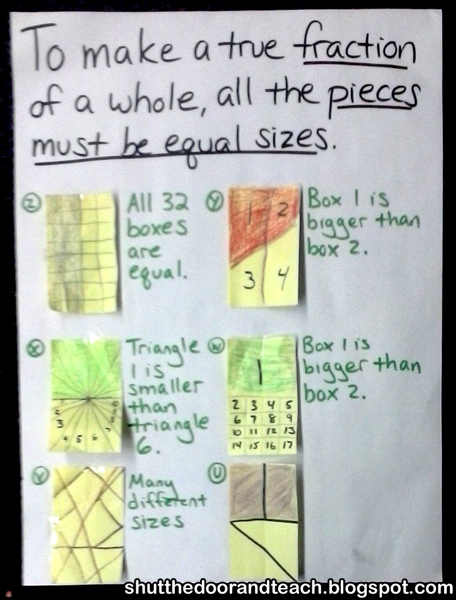 I wanted the kids to discover for themselves what happened when they broke 1/2 of a colored figure down into smaller, equal sized pieces. Today I had them vote on which they thought were right and wrong, and although the majority knew, not all of them did. I separated out the majority of the correct figures and put them on the other poster. 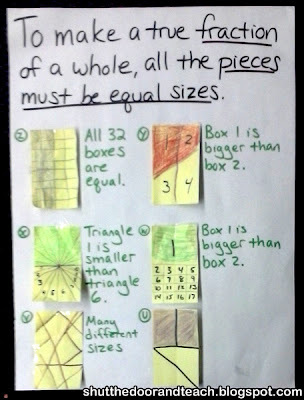 I put only one correct example on this other poster so the kids could compare the non-examples to a correct one. I wanted to hear students explain why their result was a correct fraction or not. Again, I used the definition of a fraction of a whole as something that is cut into equal sized pieces. 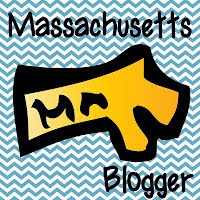 Meg over at Fourth Grade Studio has been blogging about fractions and put so much emphasis on having kids explain their thinking that it made me realize I need to do more of that. For a few of these samples, the creators were able to explain, "No, I made a mistake. This piece is bigger than that piece." 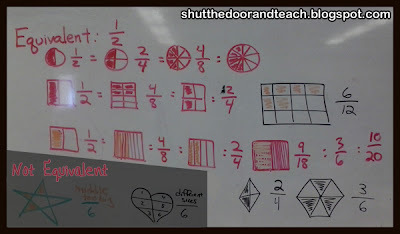 I was happy to see those kids say so, because they demonstrated their understanding of fractions, even if they aren't successfully folding them. A few kids were too shy to "admit" to their sample, (I purposely did not ask them to put their names on them since this was an introductory lesson, and I planned on mistakes happening that we could learn from) so I asked for volunteers to talk about what they noticed in those figures instead. Of the figures shown, (to the right) there were two that were the most obviously wrong to the class. One was figure w (green, right, middle) which the creator quickly spoke up and said, "Yeah, I forgot to split up the boxes on the colored side." 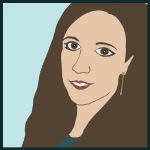 So she had the concept; she simply needs to work on rechecking her work generally. The other obviously wrong figure was figure v (bottom left). The class mentioned that not only were the shapes different sizes, it also did not have half shaded. The child who drew it stayed silent; he'd correctly created a different figure and this was an "experimental" and rushed attempt, so I knew he also had the concept already as well. The other figures resulted in rich conversation. Some of the kids were stumped with figure y. They "wanted" it to be right, because it was such a clever way of creating 1/2, but when I wrote a number in each box and asked, "Is box 1 the same size as box 2," they conceeded that they were not. A couple students pointed out that boxes 1 and 4 are equal however, which made me smile because I remembered doing proofs in high school geometry class about the exact same principle! At that point more kids said, "then figure x is also wrong, because that [box 1] is smaller than that [box 3]!" I labeled those boxes with numbers as well so the rest of the class could see it and got more "ohhhhhh"s! 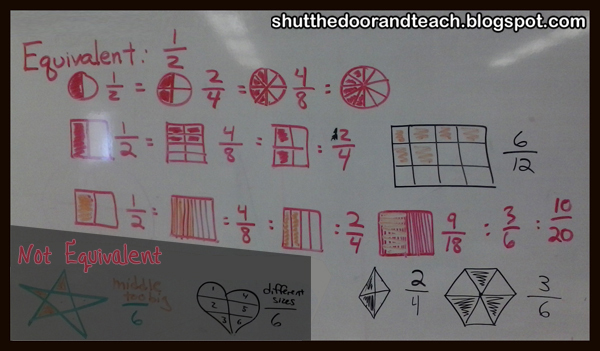 To finish the lesson, I asked students to draw fractions that are equivalent to 1/2. There are a lot more who can, but still several who are either still drawing 1/2 using different shapes instead of dividing the boxes further, some who are starting with a "creative" shape that can't be divided into more than 2 equal pieces (shows left) and others who are stuck on where to begin to create a perfect array with a set number of boxes that they have in mind. 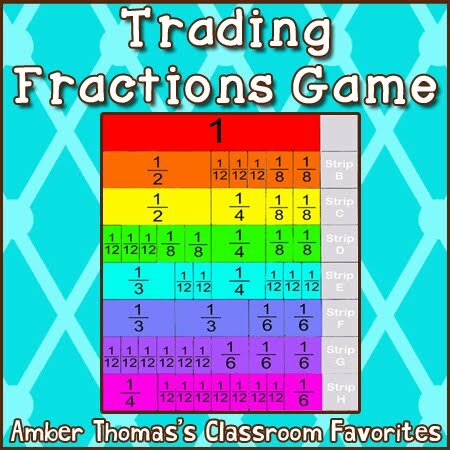 I can't wait to try Meg's next lesson on using fraction stations with my class after school vacation gets out. I've got the manipulatives for 3 of the stations, but I'm planning to substitute one of them with my Trading Fractions product. 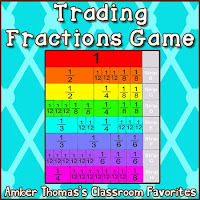 I'm excited about keeping most of the class busy, but still completely engaged in something that all ability levels can access, and only managing a small number of kids with the Trading Fractions. I'm actually almost looking forward to this vacation being over just for this lesson!